Welcome to the sixth installment of our educational Next Level series! In our last episode, Jo took you on an adventure diving for treasure in the long tail of search. This time around we’re answering the call for help when you feel like you’ve done all you can, but you’re still not ranking. Read on and level up! You’ve optimized your pages, written delightful title tags, concocted a gorgeous description to entice clicks, used your target keyword in your copy with similar words, and your content is good, like really good. As far as you’re concerned you’re doing everything you can on that page to say to Google “This is relevant content!” But, lo and behold, you’re not ranking. You’ll learn some tricks you can do in your browser and then we’ll speed things up with some cat magic and pixie dust to sprinkle all over your site. Well, you could try to call Big G (that’s what I like to call Google sometimes, just for kicks), but you may have better luck phoning yourself from 1995 with the idea for Google — then you could fix the rankings in your favor. Totally worth it. If you’re seeing the above, you won’t be able to rank because your site isn’t indexed. It’s got to be indexed before it can rank, and it’s got to be crawled before it can be indexed. Trying to rank without being indexed is like applying for a job and forgetting to attach your CV. 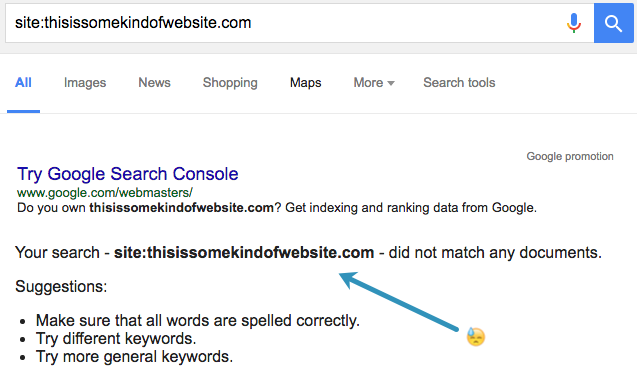 In the results page above, Google is directing you straight to the Google Search Console. Not quite as fun as Xbox or as comforting as a hug from a loved one, Google’s Search Console is still pretty sweet all the same. Go — right now, right, right now, don’t read any more, you should have already gone — go and set up your Search Console. Once you’re all set up and your site is verified, you can go to the page that I like to think of as the Fires of Mount Doom and throw in your precious. Head to “Google Index” and then “Index Status” to see the data similar to what we looked at above, but in graph form! Definitely handy for tracking how your pages have been indexed over time. If your site is not being indexed, you’re going to want to take a closer look at your robots.txt file. 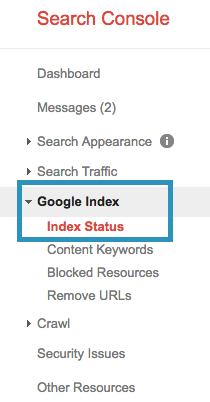 Check your Search Console Messages to see if there’s a reason Google couldn’t index your site. If Google can’t access your robots.txt file they’ll stop indexing to avoid crawling pages listed there. Now that you know your pages are being crawled and indexed, you want to get them to the top of the results where they gosh-darn-well should be, right? Now we’ve got a whole page of 50 or 100 results to search through. Use CMD + F for Mac (or CRTL + F for Windows) to search for your domain. This process is great for doing a quick check to see if you’re in the top 50 or top 100. Remember that your browser can return personalized results when you’re logged into Google, so log out and enter incognito mode. Like any good detective, make sure you record the keyword, position, and URL in a spreadsheet for Future You to discover and applaud Present-Day You on your fabulousness. Manual searches aren’t for everyone. I mean come on, we work in technology — we don’t want to be lugging keywords around the hot, dry Google search page, plugging them in one after another. I hear ya buddy, loud and clear. Let’s detach those bear hands, grab your list of keywords, and plug them straight into Keyword Explorer. Remember, you’ll need a Medium or higher Moz Pro subscription or a standalone Keyword Explorer subscription so you can create your keyword list. 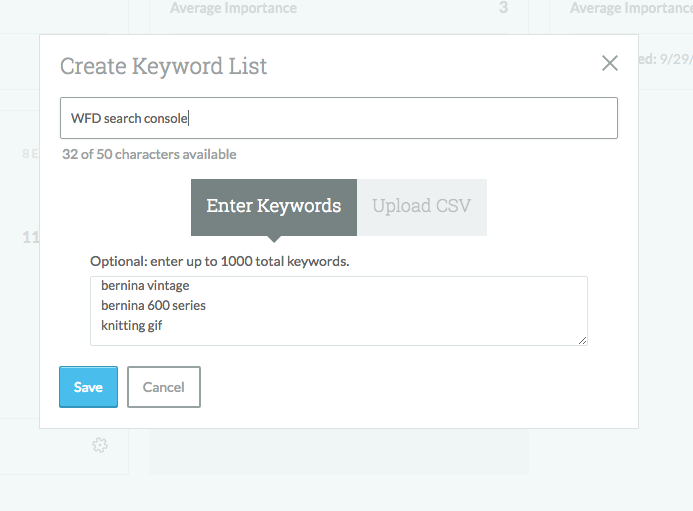 Hit “Create or upload a new list” and choose “Enter Keywords” to pop those straight in there, bish-bash-bosh. Open up a list you’ve created and pop in your URL to to see your rank from 1–10. Want to see if you’re in the top 50? Heck yeah! 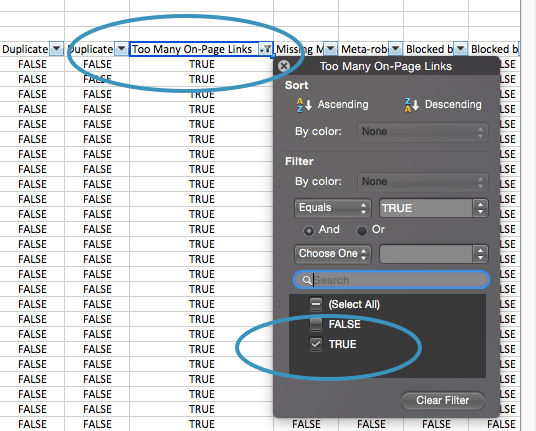 Take that same list and paste them into a new campaign in Moz Pro. If you already have a campaign running you can also transfer these straight over from Keyword Explorer. 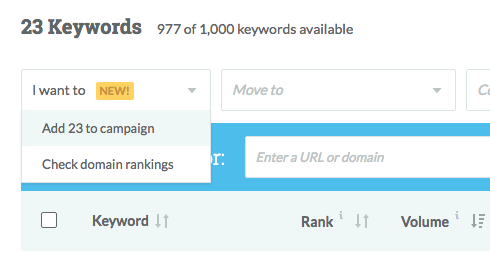 Just check the box next to the keywords you want to track, then choose a campaign from the drop down. You know before (about 30 seconds ago), when we talked about manual searches returning personalized results? Checking rankings in Moz Pro avoids all that nonsense by anonymizing the data and, in my experience, provides the most accurate results, showing what the “most” users see. Pretty snazzy, right? On the other hand, adding to an existing campaign will be a bit longer. You’ll see data as soon as your campaign updates next. So you can binge watch the whole series, because why not, right? …and we’re back! Check out where you’re ranking for your target keywords, which URL is ranking, and over time, whether you’ve moved up or down. We also pull in search volume from Moz’s Keyword Explorer to give you an idea of demand. When looking at search volume, don’t forget that the higher the demand, the more competition you’ll likely face. 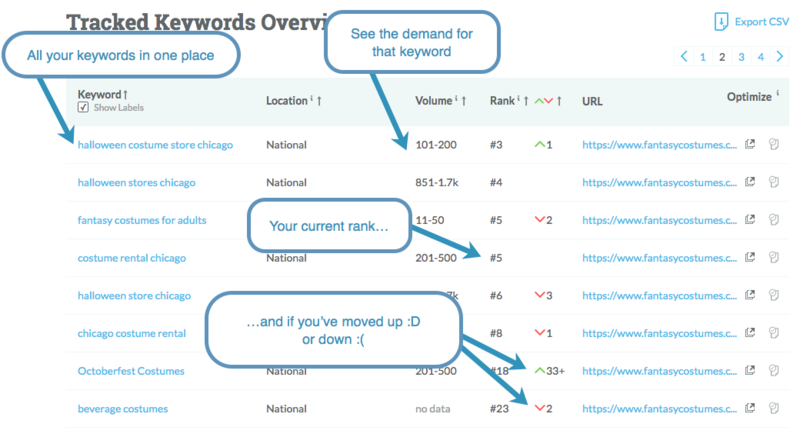 Don’t be disheartened by ranking well for keywords with lower search volume, especially if they convert better. Tracking your rankings is crucial to understanding why you’re not performing as well as you expected. If you’re seeing a lot of down arrows, you need to investigate who is jumping ahead of you and why. Let’s find some keywords that have that sad little down arrow, meaning we’ve dropped down in rankings since our last update. Here’s a little bundle of keywords that I can investigate. 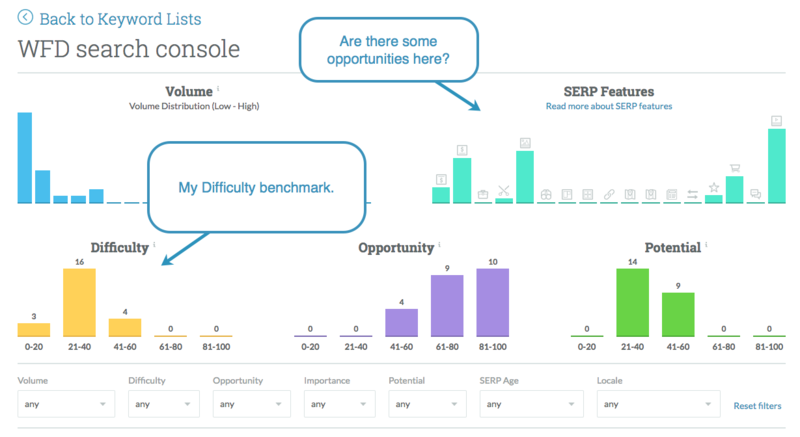 I’ll click on the keyword to open up the Analysis report and scroll down to “Your Performance.” Now we can see a historical graph of your rankings and track those other sites who want to push us to one side. And what do we have here? They’ve gone and nipped in front of us! This will not stand! It’s likely that for some reason your competitors result has been getting stronger engagement for this keyword. More clicks and more people who do click staying on the page. So let’s find out what you can do to set things right. 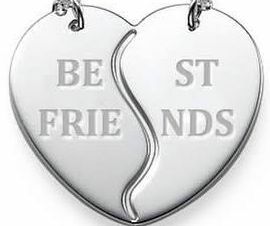 There are 2 parts to this step, just like those ‘Best Friend’ heart necklaces that were so popular in the ’90s. Separately they look like BE FRIE and ST NDS, but together…. awww, the secret code is unlocked. I don’t want to recommend you jumping in and making changes to content too often. Even Google needs time to register your updates. However, if your content is a bit dusty and you’re losing out to competitors, then it’s time to check that everything you think is in place is actually in place. I like to think of this as a “bot’s-eye-view.” When a little bot comes along, it doesn’t go, “Oooh, look at that lovely header image! Oooh, I love that font, the white space is really working for me! Oh, how the Internet has changed since my days as a junior bot trawling through gifs of dancing babies!” It reads the code and moves on. We can do this too, with a little bit of knowhow. Using Firefox or Chrome, you can right-click and view the page source. If you’re unfamiliar with reading code, it’ll look pretty intimidating. We’re going to use CMD + F (or CRTL + F for Windows) to hunt for the bits and pieces we’re after. Pro tip: If you’re seeing og:title, this is a Facebook tag. This is relatively straightforward because you control your pages. However, maybe for that very same reason, it’s still a bit of a stumbling block for beginners. I’ve been there. I once spent a whole morning trying to write a single title tag. If you’re confused and locked in a mind-melt of madness because you can’t figure out if you should use the primary keyword and/or the secondary keyword in the title tag, chill your boots. Here is a brisk and fairly brief run-through on how to get into a productive page optimization mindset. This is the bit you click on in the SERPs. Should be about 55 characters of punchy goodness that is relevant to your content. Because it’s relevant to your content, it includes the words you want to rank for and accurately describes what you’re talking about. You better believe Google is paying attention to click signals, so draw that click with your awesome headline. Think about the titles you click on when you’re searching for lovely things. Do your own searches to see what title tags are out there; it’s not like they’re hard to find, they’re literally a click away. This is the bit of text under the title tag in the SERPs. They should be about 155 characters of tender lovin’ poetry that talks to the user like they’re a real human being, because they are, and so are you (unless you’re part of the cat colony I suspect controls large portions of the web). This is not a direct ranking factor, but it can heavily influence clicks. Clicks from humans. And what do clicks do? They signal to Google that you’re hot stuff! Yep, you’re going to want to pop your keywords here, too. But really, let’s not get too hung up on this. If you’re writing something super-duper about your topic, this will flow naturally. Make it as long as it needs to be to make your point. Don’t rattle off the same words over and over; use language to the best of your ability to describe your topic. Remember all those clicks you worked so hard to get with your title and description tags? Well, if they all bounce back to search, you just know Google is paying attention to this. Your content has to be worth the click. Go and look at what type of content is already ranking. This is not an exercise in scraping content, but a way to make sure that your content isn’t just as good, but much better. This task can be done manually for a small site or for a few pages you’ve cherry-picked, no problem. Maybe you’ve been creating content like a content-creating super machine and you might have skipped a few description tags. Or maybe you copy and pasted a title tag or two. In this case, you’ll want to check that it’s all hunky-dory on a larger scale and on a regular basis. We’re going back to our Moz Pro campaign to take the heavy lifting out of this job. 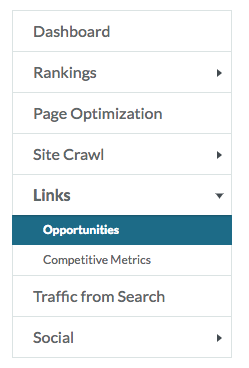 Head to the Rankings tab and hit that little “Optimize” button. Once you hit that little button, you’ve set off a chain of events where our bot looks at the keyword you’re targeting, then has a good old dig-around on your page and gives you a score out of 100. We’re hoping for that wheel of destiny to roll around to 100. 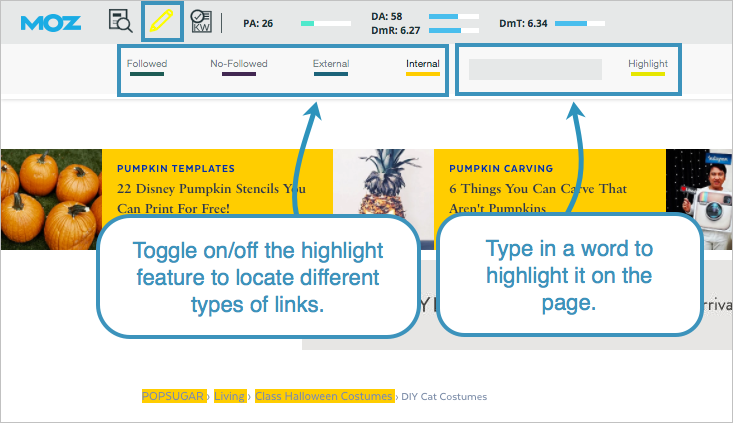 If we make it part-way around, it’s time to look at the suggestions to see how you can improve your on-page optimization. Focus on top-level pages, pages that convert, and high-authority pages first. It’s easy to become fixated on a keyword beyond what is reasonable or healthy. Are you carrying a torch for a golden keyword? Stalking it in the SERPs even though it’s completely entranced with the likes of Wikipedia, eBay, AdWords, and Image Packs? Ranking in the high-click zone for your keywords is all about beating other sites. This special, golden ticket to traffic wonderland might be a good long term goal, but you’re not going to get to the top of the results in the near future. On the other hand, maybe you’re afraid of competition, so you only target keywords with very low difficulty. This can be a winning strategy if the keywords have strong intent and you’re targeting the long tail of search, but you don’t want to put in all that work creating content and find that no one is searching for it. No searches means no traffic, and no traffic means no humans to click a thing that makes a person somewhere in the world look at their analytics data and smile. A little bit of competition is a good thing — it indicates a healthy, profitable industry. So we’re looking for a sweet spot: keywords with some demand and less competition. 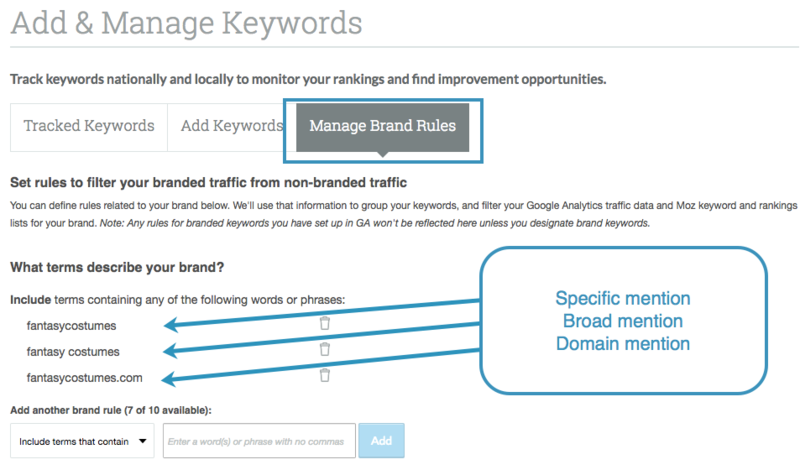 I’m going to break down what organic competition is, and how you know what level of keyword difficulty you can target. If you want to rank organically, your competition is the other sites that are currently on the first page for the keywords. It’s not the total number of sites that are using your keywords in their content, and it’s not the AdWords competition. If someone on your team, or an agency or a client sends you competition data that’s defined as low, medium, or high, this is very likely to be AdWords competition, and it relates to the cost-per-click. Moz’s Keyword Difficulty score uses the top 10 organic results to calculate the Difficulty metric. It’s a score out of 100, where a higher number means that the competition is strong, and it may take you longer to see results from your efforts. Every search you bash into Keyword Explorer shows you the Difficulty score, and you can build these into lists so you can compare related keywords. We know that Difficulty is out of 100, but a question we get all the time is: How do I know what level of Difficulty is too high? Well, first off, testing is a sure way to find out. But if you want a little pointer before you head down that road, here’s how you can quickly benchmark your site’s Difficulty rating. I learnt this tip from Russ Jones at Mozcon, so I apologies for the blatant rip-off here, but it’s too handy not to share. Time for another consoling hug from Google Search Console. Grab the keywords that are already sending you traffic from Search Traffic > Search Analytics and download them to CSV. Save these to a list in KWE. I usually copy those darlins out of the CSV and plonk them right into a new list. 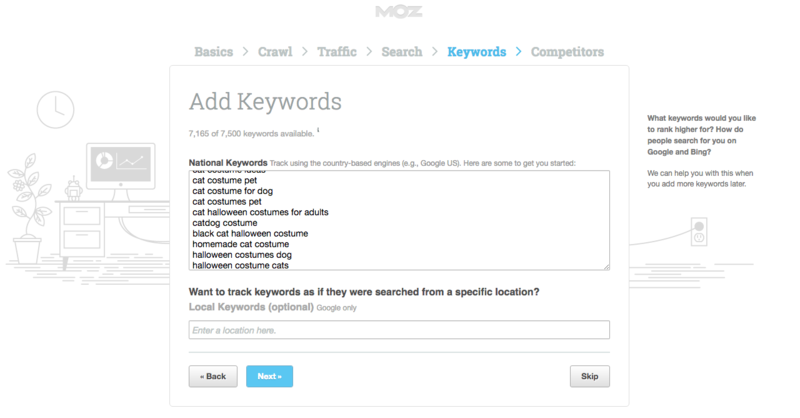 Hit “Save,” and now you have a benchmark to use when looking at other keywords you could potentially rank for. When you’re looking at keywords to target in the future you’ll have a good idea whether it’s a short-term or long-term goal. You can also capitalize on keywords you’re already getting traffic for by looking for opportunities in the SERP Features. Can you steal a Featured Snippet? I also want to track these keywords over time to see if I’m losing or gaining ground, so I’ll add them from my list straight to my Moz Pro campaign. Next time my campaign updates, and forevermore into the future, I’ll be keeping the sharpest of eyes on these keywords. Now step 5 is a real doozy, and it’s a common stumbling block for new sites. Just like networking in the real world, online authority is built up over time by your connection to sites that search engines already trust. I like to think of authority as the pixie dust from the J.M. Barrie novel Peter Pan. It’s almost mentioned as an afterthought, but without it Wendy and the gang were just kids jumping up and down on their beds. They’re thinking happy thoughts. They might even get a bit of temporary lift, you know, just like when you might get a bit of traffic here and there — enough to keep you jumping. But there’s a very big difference between jumping up and down on a spring-loaded mattress and flying off to a world of perpetual youth. 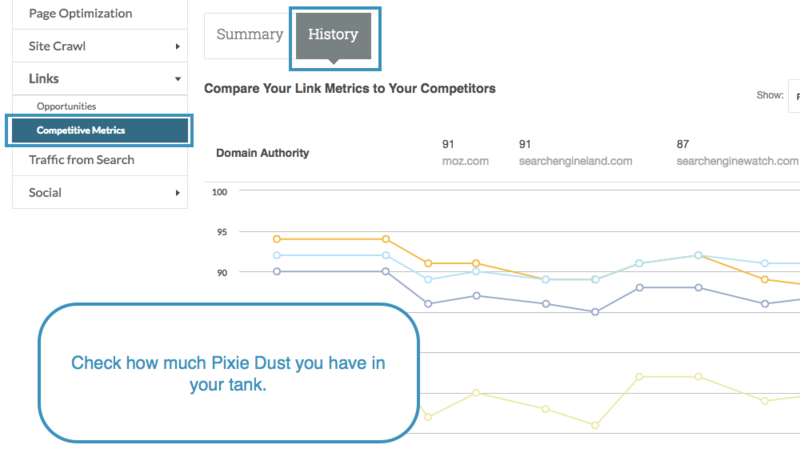 To figure out how much dust you have in your tank, you’ll need to take a look at the Moz metric Domain Authority. This is our best prediction of how well a site will rank for any given search. It’s on a scale of 1–100, and higher DA means more authority. 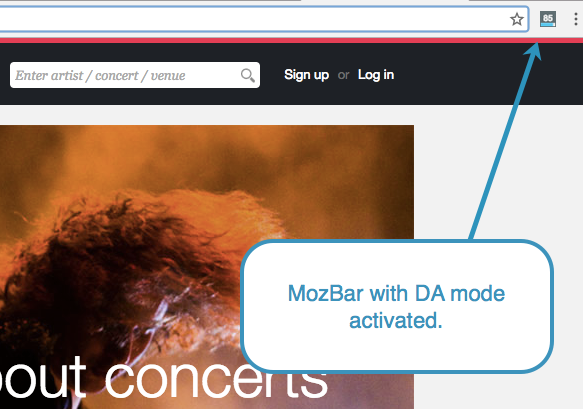 You can get your paws on DA free through Open Site Explorer or the MozBar Chrome extension. I like to keep MozBar on DA mode so I can check this metric out as I scoot about the web. You’ll want to check your DA monthly to see how you’re progressing and save this to a sheet, as incoming fresh data will replace the current data in OSE and MozBar. Once you’ve got your data, think about plotting a tasty graph to show how you’re performing versus your competitors. 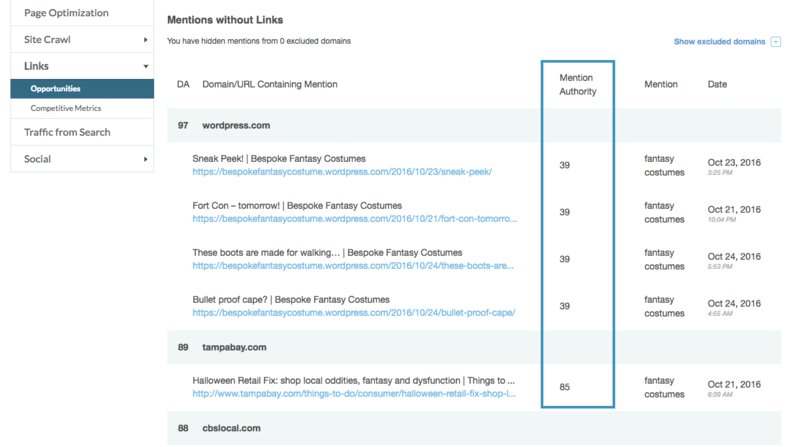 To make this a whole lot easier, head to the Moz Pro “Links” tab. Here you’ll find your historical link metrics, alongside those of your direct competitors. 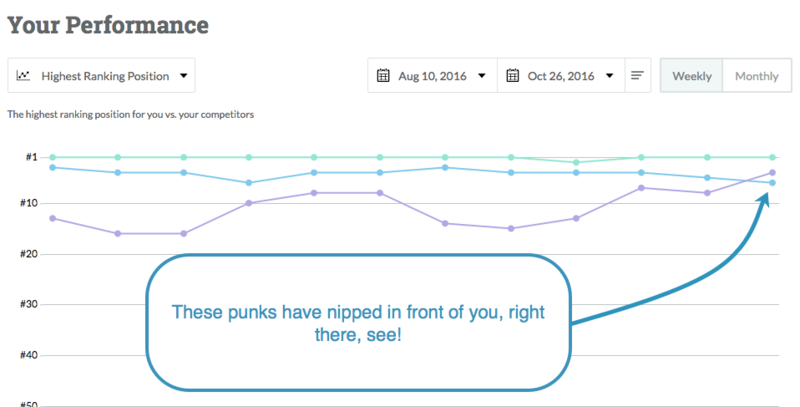 Pixie dust isn’t just powering your rankings, but everyone else’s as well. These metrics are relative with respect to the other sites similar to your own, including your competitors. The first thing we always recommend when people reach out to us to find out how they can improve their Domain Authority is to improve the overall SEO of their site. The good news for you is we’ve already done that in steps 1-4 — highest of high fives to you! The second thing you have to do is get backlinks. This is commonly known as link building. When I started doing SEO for an ecommerce site back about what feels like a thousand years ago now, I had no idea what I was doing; this term irked me, and still kind of does. It sounds like you need to build links yourself, right? Nope! It’s like you’re playing Minecraft, but instead of building the structures, you’re actually trying to encourage other people to build them for you. In fact, you’re not allowed to build anything yourself, because that’s cheating. Game changer! A lot of link building today is PR and outreach. I’m not going to go into that in this post, but I’ll include some links in the toolkit below to help you in that department. We’re going to look at what actions you can take to track and build your authority. There’s no point grabbing up pixie dust if you have a whopping great hole in your pocket. Now here’s a list of broken pages on your site that have inbound links. Any page on your site that’s down isn’t passing on its value to the other pages on your site — not to mention it’s a shoddy user experience. Look out for any pages serving a 404 status error. I can priorities the pages with the highest DA and more linking domains. I said before that you can’t build any of your links yourself. However, as with everything in SEO there’s a caveat: in this case, links from within your own site are not only key to your site’s usability, but they also pass equity. Internal linking is primarily for user experience, but it also helps bots navigate your site for the purposes of lovely indexing. Your homepage and other top pages will probably have the strongest authority, as other sites will link to your homepage in many cases. You want that high-equity page to link out to other pages in a natural way that resembles a pyramid structure. Don’t forget the user in your rush to dish out equity; do visitors want to go from your homepage straight to some random deep page on your site? Does this help them on their journey? 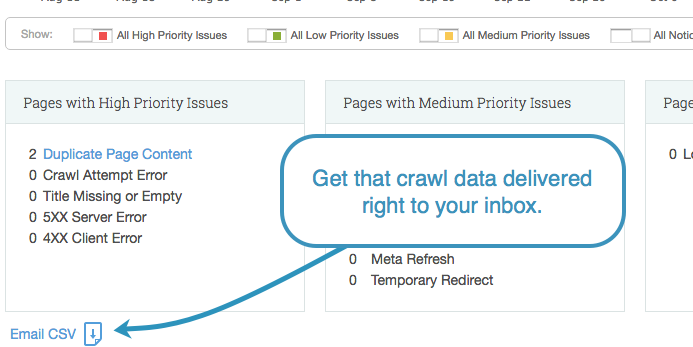 Use the Crawl Test research tool in Moz Pro to find out if any pages of your site are flagged for having too many on-page links. You also shouldn’t go overboard with keyword-rich anchor text. Once again, think about the user, not about gaming search engines. This one can get you penalized in some way, so keep it natural. If you’re scooping up big swaths of copy to get keyword-rich anchor text but it doesn’t really help the person reading the article, then maybe you’ve got yourself an awkward link at your dinner party. Links come in two flavors: follow and nofollow. Generally speaking, you do want your internal links to be “follow.” Bots will follow them on the journey of your choosing and equity will be passed on, which is just what you want. You can use the MozBar to check your pages for follow and nofollow links. Nofollow links can be marked on a link-by-link basis, or a whole page on your site can be allocated as nofollow. 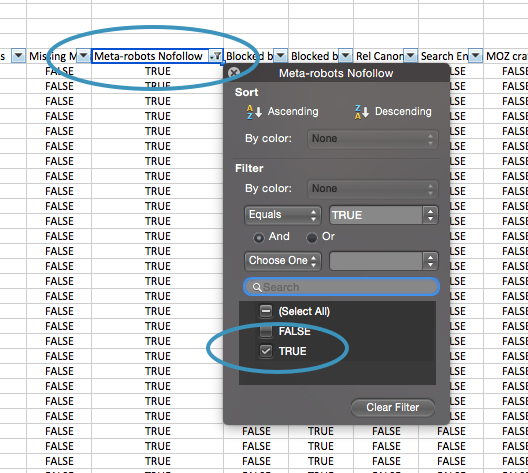 Let’s find the “Meta-robots Nofollow” column in your crawl CSV and filter by TRUE to check if you intended to mark these pages as nofollow. If people or sites are already talking about your brand, then you’re not a million miles away from converting that to a link. 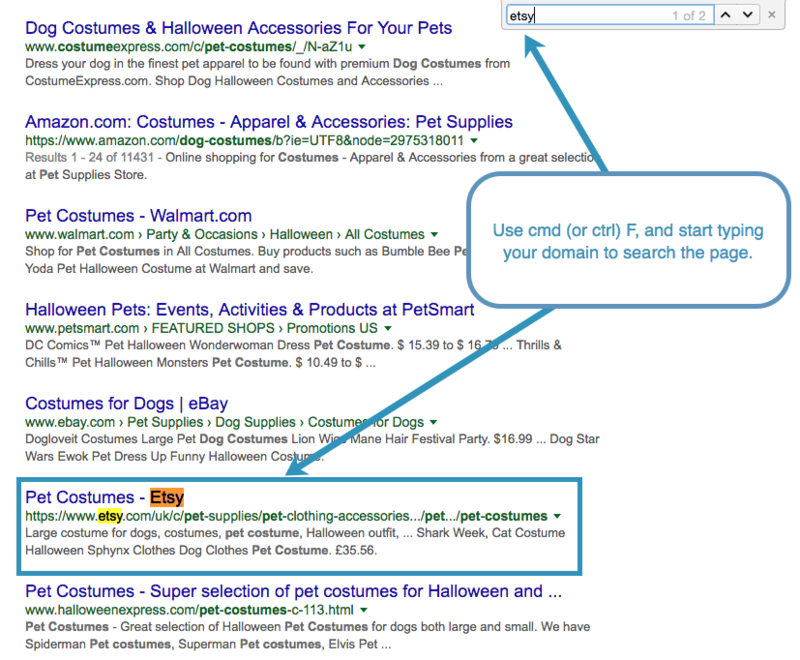 What you’re searching for are pages that mention your brand term but don’t link to you yet. This takes a bit of digging to do manually, but thankfully this is automated in your Moz Pro campaign. Having looked at these examples, maybe they’re not talking about me exactly, but that’s ok. They’re still discussing my niche, so let’s go and see who’s linking to them by popping their URL into OSE. This will give me an idea of what sort of content is valued and linked to, and I can use this to figure out my next step forward. I hope this helps you begin to uncover why your content isn’t ranking for your target keywords, and sets the wheels in motion for climbing up the SERPs. Don’t forget that Moz Pro is available free for the first 30 days and it includes Keyword Explorer, so you can start to understand your site’s authority, check your on-page optimization, track your rankings over time, and figure out how to improve them.